The #MetaHash team is proud to announce that it has successfully passed the review of the Swiss Financial Market Supervisory Authority (FINMA) and received a legal conclusion according to which the #MetaHashCoin (#MHC) is officially recognised as the utility token with payment functions. #MHC is now the world’s first cryptocurrency which received such classification at the stage of crowdsale. The process of applying to FINMA has started in the beginning of 2018 and included the preparation of required documentation and legal opinion with the help of leading regulatory and tax advisors, as well as arranging a public opening of the functioning network prior to the start of the crowdsale. 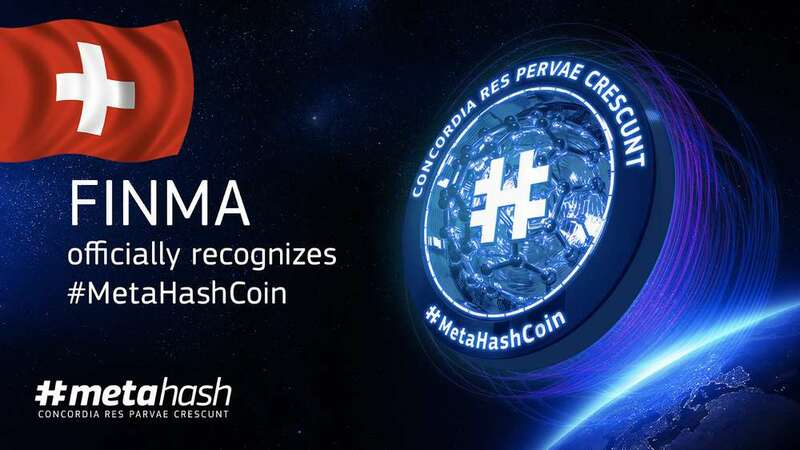 Due to the immature nature of crypto market and its regulation standards the review process has taken several months and resulted in the official conclusion which contained FINMA’s review of the #MetaHash description of business model and network’s components, and identified #MHC as the utility token which can also be used for payments within the #MetaHash network. This recognition is undoubtedly a big step forward to a more transparent, standardised and trustworthy practice of crowdsale as it clearly signals the preference of having the product live prior to the start of ICO, as with the #MetaHash case. This approach along with proper legislation of the rapidly growing market should shape into the dominant trend and work for further formalisation of crypto with its market capitalisation close to around $300 billion as an integral part of the global finance ecosystem. “If at first the government authorities were wary of FinTech and cryptocurrencies which led to point-like prohibitive regulation in different countries, recently there are more and more opportunities for positive interaction,” comments Anton Agranovsky, co-founder of #MetaHash. “Since the very start our strategic approach was based on heavy focus on legal compliance and launching the functioning network first to fit official regulations, and now we are proud that this long path has resulted in getting FINMA’s conclusion. Big deal for #MetaHash, but also for the whole industry”. Utility tokens are tokens which are intended to provide digital access to an application or service. Payment tokens are synonymous with cryptocurrencies and have no further functions or links to other development projects. Tokens may in some cases only develop the necessary functionality and become accepted as a means of payment over a period of time. Asset tokens represent assets such as participations in real physical underlyings, companies, or earnings streams, or an entitlement to dividends or interest payments. In terms of their economic function, the tokens are analogous to equities, bonds or derivatives. On 29th of June, #MetaHash, a MultiPoS consensus blockchain and decentralised real-time application platform, has opened its MainNet and started distributing #MHC prior to its upcoming start of forging initiatives. Owners of #MHC will become the first nodes contributing into the network’s growth and enjoying the full advantages of the early forging, scheduled for August, 2018. In comparison to mining, forging does not require hardware with lots of computational power like ASICs or video cards. The protection of the network consensus is based on the value of the network native coins, which is enough to rent any common web-server, or use a home PC that has a good internet connection.